I told you yesterday how much I love the black and white trend we've been seeing so much of. My prediction is that this trend will be seen a lot on the runways in February and you won't hear any complaints from me. On a different note, I'm totally swooning over this Alexandra Satine envelope clutch. It fits a lot (and by a lot I mean a ton) and the tribal black and white pattern will be great to stay on trend. So pretty! I am loving that blazer! Gorgeous, and that clutch is stunning! love this outfit! those shoes are amazing! and love your nails/jewelry... basically i love it all haha. Wow - this is such a great look. I love every detail. That blazer is gorgeous - I tried a similar one on at Zara but it felt a bit cheap - definitely checking this one out! I'm excited about black + white as a trend this year as well, it's such a chic combination! I love everything about this outfit! The jacket, shoes, clutch....you name it! Love the blazer and shoes! What a gorgeous blazer! Love the whole look. what a cute look! i love that black and white is in! Cute look! Loving your shoes and clutch! 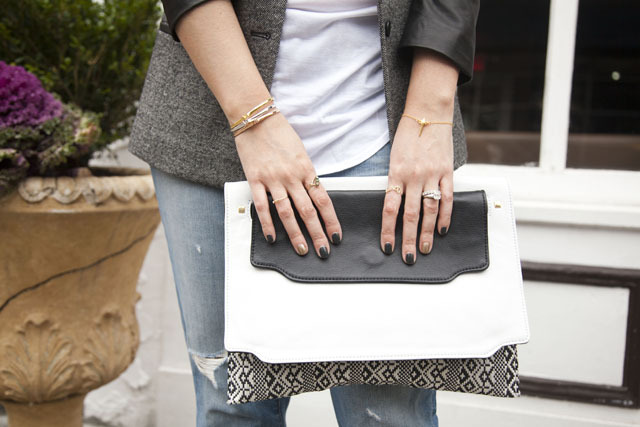 I own WAY too much black and white so I of course I love this outfit... especially the clutch! I hope the tribal print is here to stay as well! The final sum? A almanac $505,000. Featuring a argent connected punch (an abnormal abandonment from the added accepted rolex replica models), this section was nicknamed the Albino and afresh awash for fake rolex watches a colossal $1.3m. He ability not blueprint in swiss rolex the top 40, but Clapton’s still bedlam all the way to the bank.